An epic of medieval brutality, political intrigue, passionate love, and the high price of freedom, in Braveheart director and star Mel Gibson floods the screen with unbridled nationalism, thousands of extras, gallons of gore, and numerous chopped-off limbs to tell the tale of Scottish rebellion against the evil English. Late in the 13th century, a power vacuum takes hold in Scotland. Rather than leading their country, squabbling local noblemen are more interested in currying favour with England's King Edward (Patrick McGoohan). Nicknamed Longshanks, Edward takes full advantage to increase his influence by appointing English Lords over Scottish territory, and gives them the legal right to insult and demean the locals by sleeping with newlywed Scottish brides on their wedding night. 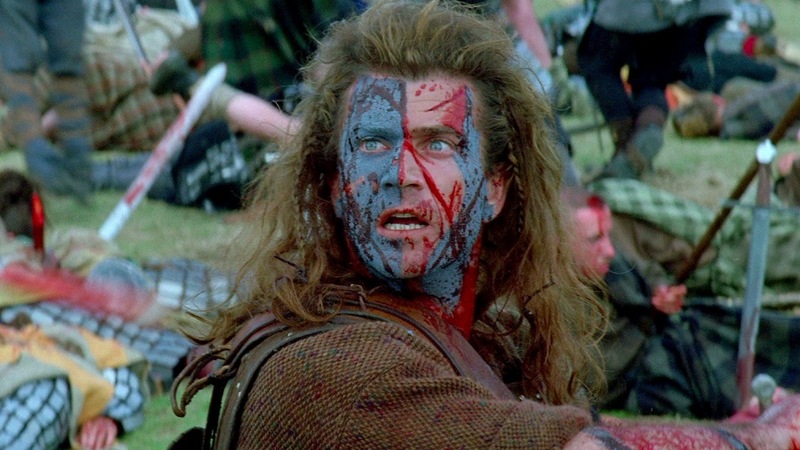 As a young Scottish farm boy, William Wallace (Gibson) witnessed the brutality of the English in his homeland, and lost his father and older brother in skirmishes against the English army. Wallace is raised and well educated by his Uncle, and he grows into a man seeking a peaceful existence as a farmer. But when his wife (Catherine McCormack) is assaulted and killed by English soldiers, he seeks a revenge that starts out as a personal matter but quickly escalates in to a national rebellion. A brutal savage on the battlefield as well as a master battle tactician, Wallace rallies the nation to fight against the English oppressors, and with the help of childhood friend Hamish (Brendan Gleeson) and other loyal followers, inspires some impressive and gory battlefield victories. Wallace's army invades northern England and brazenly sacks the English garrison in York, finally getting the attention of Longshanks. 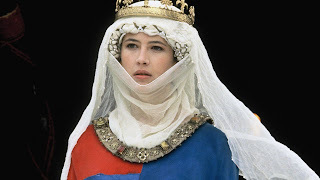 He also gets the attention of Princess Isabelle (Sophie Marceau), the thoughtful French daughter of Longshanks' weakling of a son. Longshanks wants Wallace dead; Isabelle wants him in her bed. Despite his impressive victories, Wallace never gains the support of Scotland's nobility, who see his rebellion as a threat to their long-term interests. Wallace repeatedly attempts to recruit the influential Robert, Earl of Bruce (Angus Macfadyen) to his cause, but his efforts are in vain: Robert's ailing father (Ian Brennan) is plotting to have his son appointed as King of Scotland, and this means that Wallace needs to be neutralized. Too many interests eventually line up against Wallace, and his campaign comes to a painful end, but not before inspiring a national awakening. Clocking in at almost exactly three hours, Braveheart is an impressive spectacle. The events portrayed are almost wholly historically inaccurate, but this matters little: Braveheart is a historically-inspired work of fiction, and as such, succeeds in shining the spotlight on a rarely explored period in Britain's long-ago past. 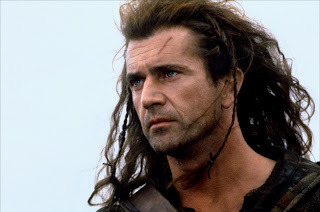 Gibson neatly divides the film into three parts, with the first hour setting the context, the middle portion chronicling Wallace's battlefield exploits, and the final part dealing with the personal and political fallout. The early scenes are slow, but once Braveheart hits its stride, it rarely pauses to take a breath, and the end result makes for compelling viewing. Gibson creates medieval Britain in all its grime, depression, poverty, brutality and overwhelming sense of despair. The leaders of society are portrayed as power-hungry, self-serving, corrupt, and depraved while their people suffer. The barbarous battle scenes, featuring thousands of extras charging at each other, raise the bar for camerawork in the midst of chaos, with the blood from the frequently hacked limbs and impaled torsos literally spraying onto the lens. The film's central message of freedom at all costs is of course simplistically hokey, and Gibson does cruise through some scenes relying on boyish charm and a mischievous glint in his eye. But with James Horner providing a suitably evocative soundtrack, Braveheart achieves its purpose of delivering a rousing epic, old-fashioned in its grandness of scale but modern in its lack of flinching from the savagery of war.